HomeRRBRRB Normalization formula released for All Exams. RRB Normalization formula released for All Exams. Railway Recruitment Board has released formula for normalization of marks for RRB Exams. 1.0, RRB examinations attract exceptionally large number of candidates. In order to conduct examination for such a large number of candidates, examination has to be held in multiple sessions. Accordingly, 2nd stage CBT was held in 10 sessions. CBT Marks are normalized in all the stages of exam and the instructions in this regard have been clearly mentioned in para 6 of CEN 01/2018. 2.0 When an examination is conducted in multiple sessions for the same syllabus, in spite of all efforts there are chances of variation in the difficulty level of the questions in various sessions. Thus the score obtained by the candidates of same calibre is likely to vary. 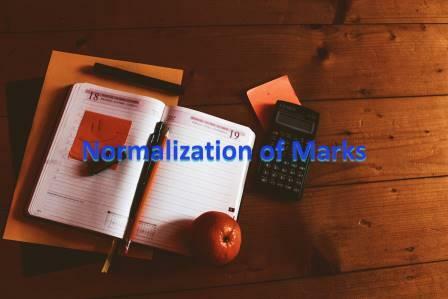 In order to equalize the variation in the difficulty level of question papers a process called statistical normalization of marks is resorted to universally. This ensures level playing field for all the candidates. In the statistical process, statistical parameters of a session e.g. mean marks and standard deviation of marks scored by the candidates in the session are analysed and based on the calculated values of these parameters a session is taken as base session (highest mean marks amongst the sessions). The normalization is carried out with respect to this base session so as to equalize the difficulty level of all other sessions to this session. In the base session, there will be no change to the score as the normalized marks will be same as the raw marks of this session. (Please see Example 5 below). Session No 7 is taken as base session based on the mean of raw marks, which is the highest amongst the sessions. Increase/decrease of one candidate may differ from increase/decrease of another candidate in the same session as the raw score is also one of the parameters in the calculation which is different for different candidates .